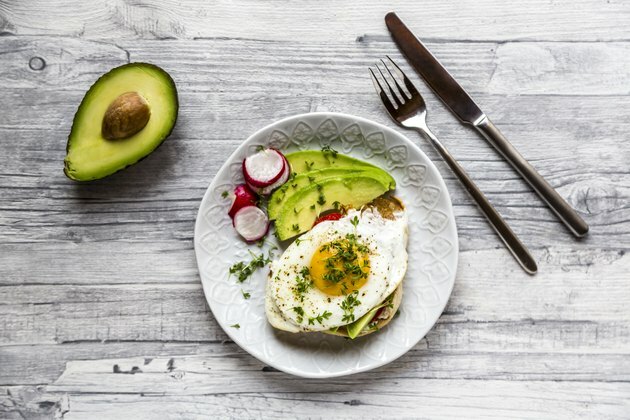 By the time you eat breakfast, you've deprived your body of calories for as long as 12 hours, depending on when you ate your last meal and how long you slept. This means that your brain, which must have glucose to work, lacks energy, and your metabolism desperately needs fuel to kick-start it into action. In short, the calories you eat for breakfast have a big job to do, so it's important to consume a sufficient amount. The number of calories you should eat at breakfast depends on your total calorie intake, but typically ranges from 350 to 500 calories. You can determine the precise number of calories you should consume at breakfast by calculating a percent of your total daily calories. If you regularly eat three meals and two snacks, your breakfast should contain 25 percent of your total calories. This percentage is based on a plan that devotes three-fourths of total daily calories to three meals and the remainder to two snacks. The goal of this type of plan is to eat about the same number of calories at each meal, so if you eat three meals daily without snacks, or you prefer six smaller meals, then divide your total calories by the number of meals. If you're not following a strict diet, you can simply go by generic guidelines. Columbia University recommends consuming 350 to 500 calories at breakfast. If you eat fewer than 350 calories, you won't get enough energy to boost your metabolism and to carry you through to the next meal. On the other hand, more than 500 calories may be more energy than you need, which means the excess calories will be stored as fat. This range works well for many people, but if you typically consume more than 2,400 calories daily, you may need 600 calories or more for breakfast. The Institute of Medicine recommends consuming 45 percent to 65 percent of your total daily calories from carbohydrates and 10 percent to 35 percent from protein. The remaining 20 percent to 35 percent of your calories should come from fats. Your breakfast should include all three macronutrients in about the same proportion, but the range gives you some leeway to design meals that work for you. If you want a boost of protein, your breakfast calories could include 30 percent protein, 50 percent carbs and 20 percent fats. In that scenario, a 500-calorie breakfast would consist of 150 calories from protein, 250 from carbs and 100 calories from fat. Make sure your breakfast calories are packed with nutrients. Choose whole grains over refined grains because they provide healthy carbs, fiber, vitamins and minerals. Eggs, low-fat milk and yogurt, as well as nut butters, are good sources of protein — and they also provide a serving of fat. While eggs are high in cholesterol, current research shows that consuming up to one egg daily does not increase the risk of heart disease in healthy people, according to the Harvard School of Public Health. If you're bored with typical breakfast foods, Clemson Cooperative Extension recommends thinking outside the box: Try eating leftovers from dinner or your favorite sandwich.